ADI unrestricted provisions (FAO/WHO, 2001). Magnesium stearate can be produced through the following procedure: first get the sodium stearate through the saponification between stearic acid and sodium; then the sodium stearate has double decomposition reaction with magnesium sulfate to get the finished product. Stearic acid and water was added to the reaction pot and heated to 85 ℃, stirring to dissolve, slowly add them to the sodium hydroxide solution preheated to 75 ℃. After the saponification reaction was completed, the temperature was controlled at 72 ℃ and slowly added to the magnesium sulfate solution preheated to 55 ℃ upon stirring. After metathesis, apply centrifuge to remove the water. The filtering cake was washed with water until sulfate ion requirement is met, then dry, apply air drying, sifting to obtain the finished products with the yield of stearic acid being 100%. It is produced through the combination reaction between magnesium oxide and food grade solid mixed fatty acids (mainly stearic acid) and further refinement. Accurately weigh sample of about l g, add 50 mL of 0.1mol/L hydrochloric acid. Apply boiling for about 30min, or until the precipitated fatty layer reaches clarification; add water to the original volume if necessary. Cool, filter, rinse the filter and filter reside with water to until that the treated solution is not acidic to litmus. The filtrate is neutralized with 1mol/L sodium hydroxide solution to being neutralization of the litmus. Upon thorough stirring with a magnetic stirrer, use 0.05mol/L of EDTA for titration as follow: to a 50 mL burette, add 30 mL titration solution. Then further add 5 mL of ammonia/potassium chloride buffer solution (TS-12) and 0.15 mL of eriochrome black test solution (TS-97), and then continue the titration to the blue endpoint. 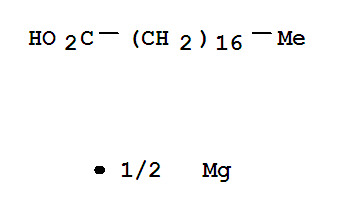 Every milliliter of 0.05 mol/L solution of EDTA disodium is equivalent to 0.15 mg of MgO2. It appears as bright white soft powder with the industrial products containing a small amount of oleic acid and 7% magnesium oxide and is odorless and tasteless. It is slightly soluble in water and soluble in hot ethanol. In baby dusting powders; as tablet lubricant. This product can be used as the thermal stabilizer for PVC, the raw material of cosmetics, flour, soothing ointment and medicine tablet (forming agents, emollients); it can be applied to the bakelite powder to make it be lubricant, bright and transparent; it can also be applied to paint industry for being used as transparent flatting agents. The metal soaps for being used as a PVC stabilizer are mostly the high-grade fatty acid salt of cadmium, barium, calcium, zinc and magnesium. Forming groups belong to the salts of stearic acid and lauric acid. The performance of the metal soaps stabilizers is different with different types of metals and acid groups with the generally principles being as follow: Heat resistance: cadmium, zinc soap has an excellent heating resistance during the initial period; barium, calcium, magnesium and strontium soap have a long-term heat resistance with lead soap existing in the middle. Weather resistance: cadmium, zinc, lead, barium and tin soap are better. Workability: lead and cadmium soap have excellent lubricating property but acid radicals is also very influential to the lubrication. For the same kind of metal, it is better as aliphatic than the aromatic group. For aliphatic acid radical, longer molecular chain will also have a better lubrication property. It is widely used in food, pharmaceuticals, paints, plastics, rubber, textiles, etc. Barium, calcium, magnesium, strontium soap has a poor lubrication property but with excellent gelling property. Plate-out property: barium, calcium, magnesium, and strontium soaps are also prone to have plate-out phenomenon while zinc, cadmium and lead soap are less prone to get plate-out issue with longer molecular chain fatty acid soaps having more severe plate-out problem as well as more severe blooming issue. Lead and cadmium soap have high toxicity together with sulfide pollution. In the non-toxic formulation, people mostly apply calcium and zinc soap; sulfide contamination resistant formula more barium and zinc soaps. Magnesium stearate can be regarded as being non-toxic, the United States, Germany and Japan allow it to be applied to products being contact with food. However, it doesn’t have wide application to be applied as PVC heat stabilizers. In China and some other countries Pharmacopoeia, there are always records of this specie. The pharmacopeia has also made provisions on the magnesium content, moisture, heavy metals, iron, sulfate and chloride content. Magnesium stearate is a kind of fatty acid salt type anionic surfactant with its appearance being white powder with slight special smell and creamy feeling. It can be soluble in hot aliphatic hydrocarbons, hot arene and hot grease but insoluble in alcohol and water with being decomposed into stearic acid and corresponding magnesium salts in case of acid. Magnesium stearate has an excellent adhesion property to the skin with excellent lubrication property. It can be applied to powder products in cosmetics and can improve adhesion and lubrication. Laboratory, through the replacement reaction of sodium stearate and magnesium sulfate, is able to get finished product of magnesium stearate and can also apply the combination reaction between edible solid organic acids (stearic acid, palmitic acid) mixture and magnesium oxide compounds and further refinement to make it. FAO/WHO (g/kg): apply glucose powder and sucrose powder 15 (in the absence of starch); soup 15. GB 2760-2001: gum base agent, candy, GMP as the limit; preserves 0.8g/kg. widely used in the fields of the plastic, mold-releasing agent for tablets (need meeting the medicine criterion), emulsifying agents of cosmetics. It also can conjugate with Ca Soap as stabilizer of PVC.